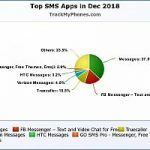 SMS Tracker is a free Spy app for Android. Use it to get SMS and Call logs of the device on which its installed. You can also use it to view and keep backup of SMS and call logs for future reference. Very simple interface but highly effective.